Bee Leader - It's busy time. The bees need you! Become a Bee Leader and help the bees fill their hives with honey. 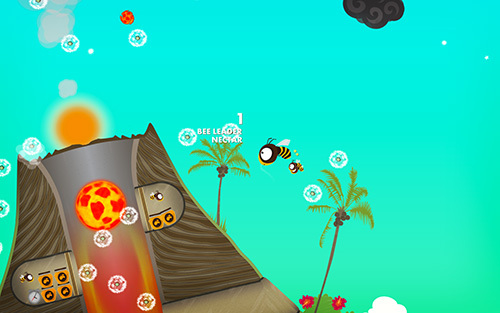 Bee Leader is an award-winning arcade game available for popular mobile and desktop platforms. The original award-winning Bee Leader. Compatible with iPhone, iPad, and iPod touch running iOS 4.3 or newer. The game supports both SD and HD/Retina displays, and iPhone 5 & 5S widescreens. 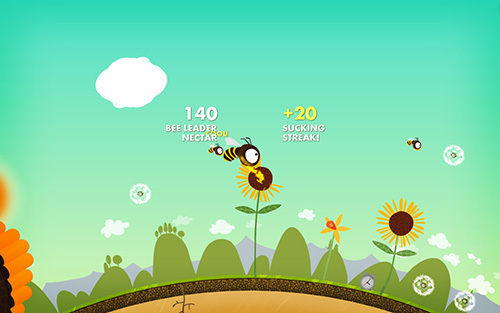 We partnered with Microsoft and Rush Digital to release Bee Leader for Windows Phone 8. The latest version supports a free trial mode that lets you play the Trailer Park and Just Desert worlds for free! Bee Leader is now available for Android! It is compatible with thousands of phones and tablets of all shapes and sizes running Android 2.3 or newer. 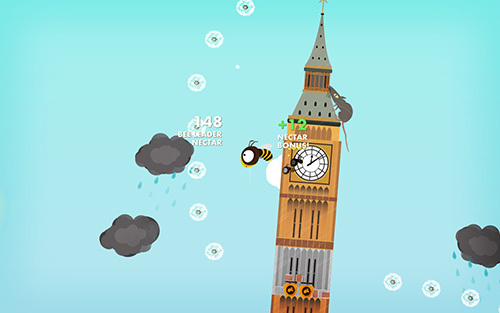 Released not long after the iPhone version, the Mac version of Bee Leader delivers big-screen fun and has experimental support for selected gamepads and console controllers. It runs on OS X 10.7 Lion or newer. 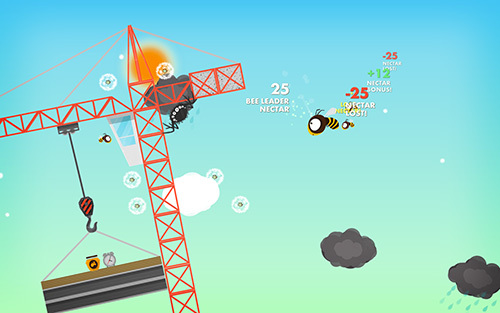 We partnered with Microsoft and Rush Digital to release Bee Leader for Windows 8. The latest version supports a free trial mode that lets you play the Trailer Park and Just Desert worlds for free! Bee Leader for macOS was just released (April 2018) on itch.io, DRM-free! Check back again soon for future announcements. After extremely limited popular demand, you can download the Bee Leader soundtrack free for personal use. Fly around the world and hover over flowers to collect nectar. Look out for enemies and bad weather! Collect as much nectar as you can before the sun sets. The faster you get nectar back to your hive the more honey you'll make! 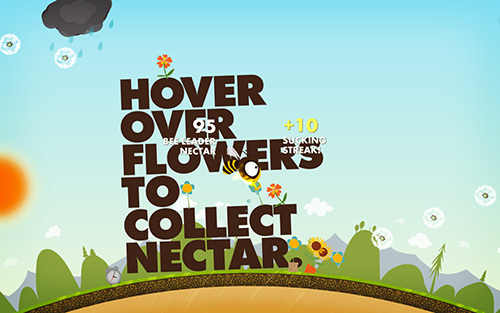 Pick up plenty of bonuses along the way - nectar, honey, time, and bee buddies. The more bee buddies you find, the more nectar you'll collect. More nectar means more honey - sweet! To climb up the Bee Leader ranks fly through different worlds making honey - Just Desert, Country Life, City Heights, Island Time, London Fun and Climate Change*. Each world has different obstacles, enemies, flowers, bonuses to break open and other fun interactive goodies. Some worlds are small, others are big, and there's a few surprises along the way. Control your bee using your preferred method: joystick, touch or tilt (mobile devices), or keyboard, mouse or gamepad (desktop devices). You can also remotely control Bee Leader for iPhone, iPad and Mac using another iOS device via wifi or Bluetooth using Joypad, available free from the App Store. Beautiful design & illustration - full HD/Retina and Widescreen support on iPhone, iPad & iPod touch - 16 levels over 5 different worlds (*or 19 levels over 6 different worlds on iPhone/iPad/Mac) - cool flight model & fun physics - great interactive sound - social networking & sharing support (on supported platforms) - full remote control via wifi/Bluetooth using Joypad* - leaderboards & achievements* - pesky hornets. Additional Platform Development by Rush Digital Ltd.